The first year and a half is usually the worst phase of sleeplessness at night for the newborn and so the toughest phase for new moms as they struggle to cope with the maternal duties round the clock. Does your baby also wake up suddenly in the middle of the night despite your best efforts to avoid it? If you are still clueless as to why this could be happening, read on to know what could potentially be the cause. Why Babies Wake At Night? How Do I Prevent Baby Waking In The Night? Ensure that the temperature in your baby’s room is comfortable. It should not be too hot or too cold for your baby. Dress your baby according to the weather and the temperature inside the room. Babies find it very difficult to adjust to a sudden change in routine. If your baby is used to falling asleep at a particular time at night, make sure you follow the pattern every day. Try and maintain your baby’s bedtime rituals as much as you can, even if the baby is away from home. This will help your baby know that it is time for bed. If your baby is full before falling off to sleep, chances of waking up in the middle of the night will be lesser. Ensure your baby has a healthy and filling dinner before sleep creeps in. Healthy eating is also important throughout the day as tummy trouble too could be the cause of his disturbed sleep. If your baby has fallen asleep without eating, you may try to wake up the baby by gently calling out his name. 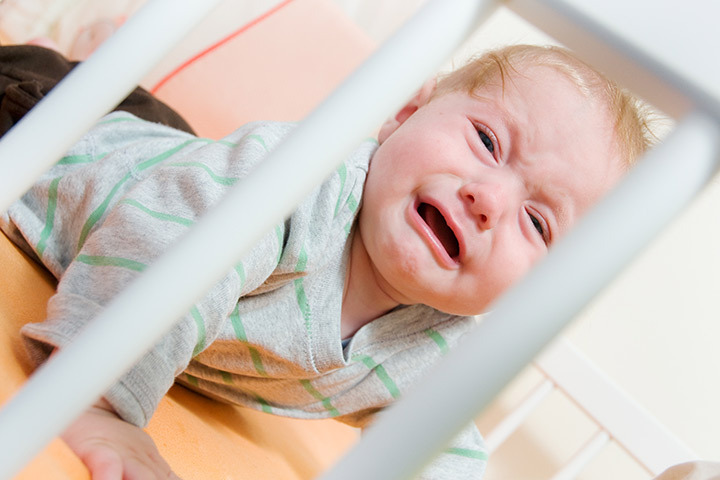 Avoid playing, talking, or doing any fun activity with your baby at odd hours. If your baby starts getting bored, chances of him falling back to sleep sooner will be more. Simply be there with your little one so that he feels calm and can fall back to sleep. Hope by now you are clear that why babies wake at night. Do not worry too much about the baby’s nocturnal activity. Remember that waking up in the middle of the night is restricted to your baby’s first few years only. While most babies learn to sleep through the night sometime during the first year itself, others may take slightly longer. Moms, how did you manage to make your baby sleep through the night? Do share your tips here with other moms. Next Post: When Will Your Baby Develop The Pincer Grasp?